New York iPad Subscriptions Are Now Half Off! 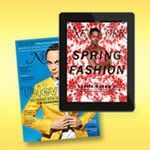 From now until July 16, 2014, annual subscriptions to New York’s fancy iPad app are just $9.99 (instead of the usual $19.99). For that extremely reasonable price, you’ll get complete, iPad-optimized versions of the weekly magazine, exclusive video and audio content, and a live-stream of news, features, and other good stuff from New York Media’s network of websites (including Daily Intelligencer, Vulture, the Cut, and Grub Street). Subscribe now and get instant access to the latest issue. Plus, you won’t have to wonder what to read on the beach for the rest of the summer (or ever again).